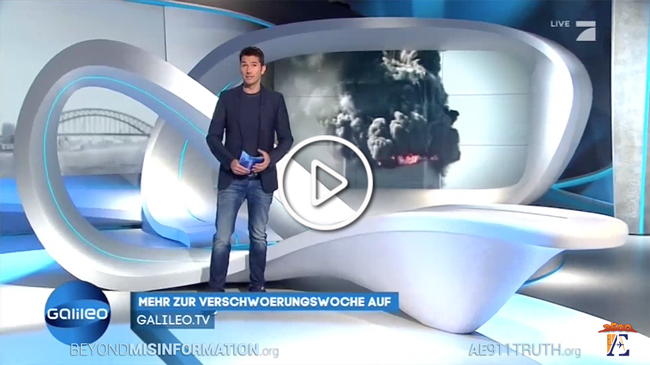 On Monday, May 23, one of Germany’s most popular television shows, “Galileo,” aired a 15-minute segment about the ongoing efforts of Architects & Engineers for 9/11 Truth and 9/11 family member Bob McIlvaine. “Galileo” reaches an audience of some two million in Germany each day and is syndicated across Europe. Watch the special now! 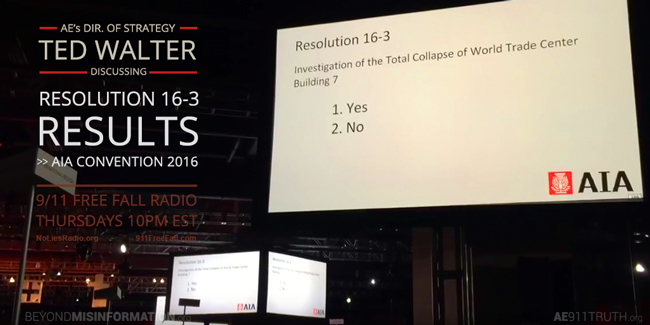 Tune in to “9/11 Free Fall” with Andy Steele as AE911Truth Director of Strategy Ted Walter returns to discuss the AIA Convention in Philadelphia last week, including the results of the vote on Resolution 16-3. Thank you for your support of AE911Truth. Without you, we wouldn't exist. Our Blueprint Newsletter archive for 2014/15 can be found online on our main site. Did you know a 3rd Tower Fell on 9/11? Discover more about AE911Truth and our Mission. Subscribe for News and Updates. Your email is confidential to us and will not be misused. AE911Truth is a 501(c)3 educational organization. Donations are tax deductible per codes and regulations. Copyright © 2016 AE911Truth.org, All rights reserved. 2342 Shattuck Avenue, Suite 189, Berkeley, CA 94704. If you prefer not to receive communications from AE911Truth, unsubscribe from any future mailings by clicking here.